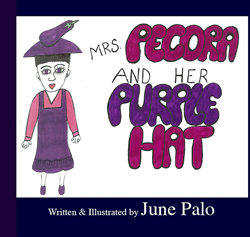 Thursday, March 30th at the PepperJack Grill in Staten Island, Boulevard Books author and artist, June Palo will take part in a children's book presentation for MRS. PECORA AND HER PURPLE HAT, a children's book for the whole family. Thursday, March 30th at the PepperJack Grill in Staten Island, Boulevard Books releases Mrs. Pecora and Her Purple Hat, the first book in a series by author and artist, June Palo. The series takes Mrs. Pecora and her family through their journey of ordinary days, which become extraordinary. The book is inspired by June Palo’s family, heritage, tradition, and culture. Boulevard Books is an educational publishing company founded in 2010 by author Avi Gvili. Described as the UBER of publishing, it aims to publish the newest voices of the 21st century by empowering authors with ownership of their work.